Airports are becoming larger and a lot more of the Global population are travelling by plane these days. Who can blame them? It’s faster and more convenient! One of the hassles that we come across during flight travel though is waiting around the terminals. Airport designers ensure that through the use of furniture design, shops and restaurants the waiting time in airport spaces are an experience rather than an uncomfortable occurrence. With the rapid increase in passengers, more seating is required within airport terminals. Unfortunately delays are sometimes inevitable for airlines so it is important the furniture ensures delayed or waiting travellers are comfortable and appreciate the environment that they are in. This can be achieved through the style of seating and the facilities given to them. Beam seating has been a favourite for the airport interior design industry over the last few decades due to practicality. 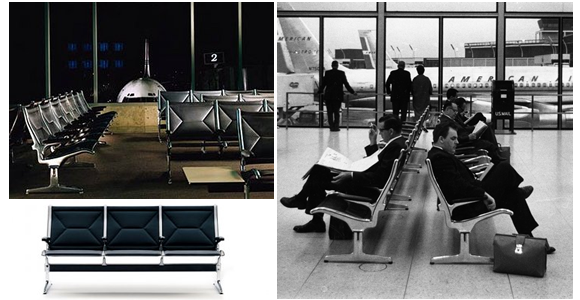 Keeping style and feasibility in mind, Charles and Ray Eames inspired the industry with their “Eames Tandem Sling Seating” that was installed into O’Hare Airport in 1962- a time when international air travel was more accessible and popular. Addressing the “need for comfortable, attractive and sturdy public seating” their design was based on “The Sling System” that was also developed for their aluminium group chairs. Making sure that the beam seating was “inviting” for passengers to use, Eames used a modern, sleek style with quality leather. The aluminium frame style, creating a curvaceous structure, emphasised the “flow of air” that is continuously circulated around the large terminal space. The extra wide, padded seats ensured that the consumers were comfortable and there was plenty of space available for their luggage underneath the seats. The leather was practical for the upkeep as it was easy to clean and maintain and the stitching detail added an element of sophistication. As with a lot of the Eames furniture triumphs, the style of the beams has since become a timeless classic. They were comfortable, practical and a pleasure to look at whilst waiting for a flight. Keeping the passengers in mind, the seating system really set the benchmark for airport seating, a design idea that has been carried through to today. So what are airports doing now to accommodate the influx of their tourists? 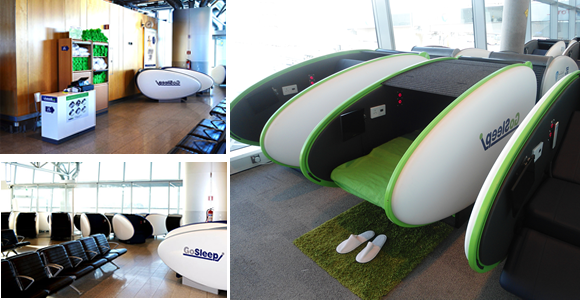 To accommodate their tired passengers, in 2013 Helsinki Airport provided “GoSleep Pods” within the terminal. They were the first European airport to provide their passengers with this ability and they have seen wonderful results since. They are designed by Finnish company “Uni Solutions Ltd”, their main aim; to take the stress out of travelling. To catch up on some much needed rest, travellers are able to “rent time” in a quiet, comfortable pod. Blankets and other accessories are available for purchase to make the experience even better. This beats trying to sleep on a beam system, or even the floor! The cosy pod will ensure that consumers are relaxed, caught up on sleep and this therefore makes the flight experience more enjoyable overall. Another fantastic airport that has been designed with their visitors in mind is the Hamad International Airport in Doha, Qatar. It utilises high ceilings, art installations and expansive concourses to create an element of grandeur. It’s incredible! In addition to a gold plated coffee counter (seriously), the designers have also installed a variety of seating ranges to ensure that the visitors are able to experience the best possible time in the airport. Curves play a large part in the design of the seating areas, incorporating this into beam systems and breakout areas. The furniture used seems to complement the “flowing” style of the terminal building. The “curve” of the building creates a system where air is able to cross through the building freely (like Heathrow Terminal 5) and the seating areas are left with plenty of space and room to reflect this. Sleek, thin and smooth seating styles eliminate the feeling of being “crowded” or “cramped” which usually comes from being surrounded by other passengers. This in turn reduces stress levels. 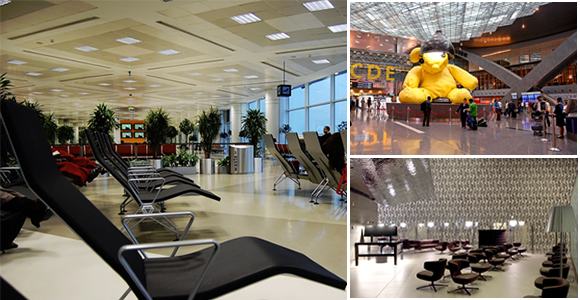 There is a variety of different styles and configurations within the airport space. The mix between leathers and fabrics, contemporary and traditional are all very pleasing to look at. With all these beautiful furniture pieces, as well as the decor, restaurants and retail shops, you won’t want to board your flight! Schiphol, in Amsterdam, seems to have gone a few extra (air) miles to accommodate their visitors too. Embracing the outdoor elements of nature, they have incorporated an “indoor park” within the terminal building. Despite being a large environment, a terminal building can make you feel claustrophobic and “trapped” when waiting for a flight. Wanting to move away from this illusion, the designers of the “Schiphol Airport Park” have created an indoor/ outdoor space that allows passengers to “get away”, relax and unwind. The seating that has been used is “organically shaped” and natural shades of green are used as upholstery options. There are shades of timber, artificial trees and other natural features. With the use of “mixed reality technology” there are also sounds of children playing, birds singing and projected butterflies, all creating the impression of being in an outdoor space, despite being indoors. Artificial logs are placed in the “park area” to be used as benches and real timber is used on others. The soft seating areas are placed together, almost aerodynamically, to create plenty of places to sit without compromising space. Walking through this area is like taking a stroll through the park. 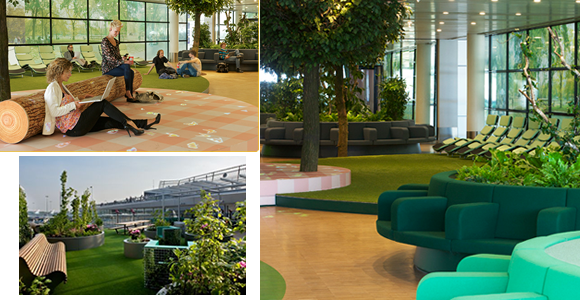 Extending to the outdoors, the Schiphol Park has carried on the “natural theme” onto a roof terrace. The benches that are placed here have ivy growing out of them. Fusing a growing plant onto the metal structure emphasises the power that nature has, having ivy “take over” a man-made structure. The oxygen levels are also increased through photosynthesis, thus relaxing the passengers sat on or around the ivy benches listening to the iron birds in the sky. As the sleek design of aluminium and fine leather will continue to be a favourite style for airport interiors, it is becoming more evident that airport furniture designers are keen to keep up with customers’ needs and demands. Wi-Fi, USB charging and cup holders are popular features to be incorporated into the beam seating choices. The main focus will be ensuring that there is plenty of space, comfort and an enjoyable experience for everyone passing through. This is making me want to go on holiday!